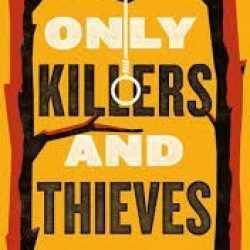 Only Killers And Thieves, the first novel by UEA alumnus Paul Howarth, has won the Barnes & Noble Discover Award, which is awarded to the best novel published in America by a debut or emerging author. It was published last year in the UK by One, an imprint of Pushkin Press, and by HarperCollins in the US. In 2018 it was also nominated for the $50,000 Kirkus Prize and has just been shortlisted for the American Booksellers’ Association “Indies Choice” Award in the Debut Novel category. Paul was born and grew up in the UK and lived and worked in Australia for several years, gaining dual citizenship in 2012. He graduated from the MA in Creative Writing (Prose Fiction) at UEA in 2015, having been awarded that year’s Malcolm Bradbury Scholarship. He lives in Norwich with his family.